Recollecting Nemasket: "What's the Matter with Biddy?" ugh residents complained of the lack of inexpensive laundries in town, the Plymouth Old Colony Memorial retorted, “What’s the matter with Biddy?” giving voice to what that era saw as a natural link between Irish-American womanhood and domestic service, and indicating the ethnic prejudice which Irish immigrants faced locally. 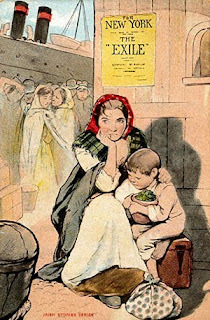 In the first three decades of Irish Famine immigration to Middleborough (1845-75), many Irish women would, in fact, find their employment as domestics in local homes with the percentage of Irish-born working age Middleborough women engaged as domestics peaking around 1855 at just under two-thirds. Thereafter, the proportion of Irish women in domestic service in town declined to about one-third in the 1860s and was down to less than one-fifth in 1880. The fact that corresponding rates for the city of Boston are much lower during this same period (even when their inaccuracy is taken into account) indicates the paucity of job opportunities in rural areas like Middleborough for foreign-born women with little or no education. Further, the fact that the percentage of Irish-born women in Middleborough engaged as domestics is very high very early in the period seems to indicate that the majority of these women came to town with the express intent of seeking employment as housekeepers, cooks, laundresses and nursemaids. Most of these women were young, generally in their late teens or early twenties, unmarried, and willing to perform the domestic work which was regarded by many Yankee girls as either beneath their dignity or financially not remunerative. In return for a small salary and (in most instances) room and board, Irish domestics worked anywhere from twelve to sixteen or more hours daily with usually one afternoon free each week. Though admittedly grueling, positions as housekeepers, cooks, laundresses and maids tended to be more comfortable and financially rewarding than factory work. Additionally, domestic service permitted Irish women a degree of freedom not experienced previously, allowing them to live independently and affording them an upward mobility hitherto unknown to them. And while some social historians have argued that the prospect of domestic work attracted Irishwomen to emigrate by holding out the possibility of a better life, there was also an economic imperative which compelled Irish women who had already emigrated to accept work - any kind of work - which would afford them a modicum of financial security. Unlike other later immigrant groups, Irish women frequently emigrated alone, with neither family or friends to accompany them, though this circumstance often added to their feeling of isolation in America. Many, like Sarah Moran who found employment in the home of Elijah Alden at North Middleborough in the early 1850s, sought to reconnect with other members of their families who had emigrated separately. In 1855, Sarah placed the following advertisement in the Boston Pilot, a noted resource for Irish immigrants seeking one another. OF THOMAS MORAN and family, of Larkfield, parish of Killarguy, co. Leitrim, who sailed from Sligo for Quebec in ship "Augusta," April 20, '54, and has not since been heard of. Please address his sister Sarah, North Middleboro', Mass. Initially, Irish domestics had to overcome prejudices against their presumed sloppiness, gossiping, laziness, carelessness and propensity to steal from the pantries of their employers. Particularly in the hysterical anti-Irish press of Boston, these women were stereotypically depicted as Papal agents eager to reveal family secrets to the parish priest in the confessional or (in the case of nursemaids) trained to indoctrinate their charges into what some considered a “heretical faith.” Irish women were typically portrayed in cartoons, songs and pantomines as grotesque caricatures and were commonly mocked as "Biddies" (Biddy being the pet form of Bridget and in American eyes the female equivalent of Paddy). Nonetheless, the social status implicit in the employment of Irish, or for that matter, any domestic help was not overlooked, and probably outweighed these fears and prejudices. Most of the families living on North and South Main Streets during the period in question employed Irish domestic help, most often a live-in housekeeper, including Colonel Peter H. Peirce, Ira Thomas, Attorney Everett Robinson and Professor J. W. P. Jenks on North Main Street and Allen C. Thatcher, Philander Washburn, Dr. John Perkins, James M. Pickens and Nathan King on South Main Street. And while a great many Irish-born women were employed as domestics in the grand homes of Main Street, an equal number were engaged as domestics on the farms in the outlying districts of town. Because many Irish women were simply seeking to build up a small cache of funds to enable them to move on, many to families awaiting them elsewhere, the turnover rate for Irish domestic help in Middleborough was relatively great, the majority of female domestics not remaining with any one family for more than a few years. Most notably, the households of Allen C. Thatcher on South Main Street and Peter H. Peirce on North Main Street employed a succession of Irish-born maids, each engaging at least four different Irish-born servants in the course of fifteen years (1850-65). However, in the case of the latter household (which following Peirce’s death was overseen by his daughter Harriet Rice), one suspects that the family’s eccentricities may have contributed to the lack of domestic continuity. Contrarily, some domestics remained with a single employer for several years as was the case with Rebecca Wilson who was employed by merchant Philander Washburn in his South Main Street home for ten or more years. Those who could afford to do so employed more than one Irish domestic, though in this category in 1850 there were only six households: William C. Eddy, Dr. George Sturtevant, James Wilder and James A. Leonard each employed two Irish domestics while Reverend J. Austin Roberts and Philander Washburn both employed three. Washburn’s help consisted of a 25 year old laborer named John who probably was employed as a gardener or handyman, 18 year old Ann Fitzpatrick and her 16 year old sister Eliza who probably were responsible for the upkeep of the house and the preparation of meals. Three Irish servants assuredly bestowed a certain social status upon Washburn which even the presumed financial profligacy of the Peirces could not match. Not until the late 1850s did the Peirce family employ multiple servants though, admittedly, that family was much tighter fisted with its money than was Washburn. Not only were young Irish women employed in local households as domestics, but they served in the same capacity at the Nemasket House hotel on North Main Street, working as cooks, chamber maids, kitchen help and "table girls". Indicating the toilsome and often lonely life of the Irish domestic was the death of Katie McManus, a Nemasket House maid who was found dead in her bed of apoplexy one July morning in 1873. She was just 26 years old. By 1880, the concept of live in domestic help had become so firmly entrenched among the Middleborough well-to-do that middle and upper class homes constructed during the mid-Victorian era like those of John A. Miller on South Main Street and John C. Sullivan on Pearl Street made accommodation for this social phenomenon in the form of upper-story servants rooms and the ubiquitous “backstairs.” Americans with their large families and large houses, in fact, became so dependent upon Irish domestic help that they couldn't fathom life without an Irish servant, despite their prejudice against them. Alternately suspicious, distrustful and demeaning to their Irish help, many American housewives "yield[ed] tremblingly, because 'it would be too dreadful if Bridget were to leave'", or so wrote Christine Terhune Herrick in the Ladies' Home Journal in 1886. Yet despite the need for and the social cachet of Irish domestic help, the number of Irish-born women engaged in domestic service in Middleborough nevertheless declined during the late 1800s for several reasons. First, marriage tended to remove these women from the domestic labor pool since they had to assume the work and responsibility for raising their own families and keeping their own homes. Significantly, the number of Irish-born Middleborough housewives rose from 17.5 per cent of the total Irish female working age population in 1850 to nearly 42.7 per cent in 1860, plateauing at about 50 to 55 per cent in the 1860s. Such a trend correlates to the obverse decline in the number of Irish-born domestics during the corresponding period, and the void left by these women was often filled by newer immigrants arriving from central and southern Europe. Secondly, the rise of woolen manufacturing in town following the 1860s offered an alternative form of employment for Irish women though it never took in large numbers of women in Middleborough. Whereas domestic service had been virtually the sole occupation open to women of limited education or foreign birth in the 1850s, the application of steam power to the factory system following the Civil War meant that women could enter the industrial labor force as great manual strength was no longer required to operate mill machinery. Prior to the opening of the mills to women, only one Irish-born Middleborough woman found employment outside domestic service – Julia Sullivan who was engaged as a milliner. Thirdly, the Irish-born population in Middleborough was evolving. Consequently, as Irish women grew older and the term of their residence in the country lengthened, they either became unattractive to employers who preferred younger women or they, themselves, felt disinclined to take what they increasingly came to regard as menial work. Meanwhile, as younger Irish girls began to acquire an education and grow accustomed to Yankee society, they too were often put off by the thought of domestic service. The rapidly declining number of Irish-born women seeking domestic employment at the time the Memorial made its quip in 1872 in fact indicated their quickening assimilation into American society in general and local Yankee society in particular. 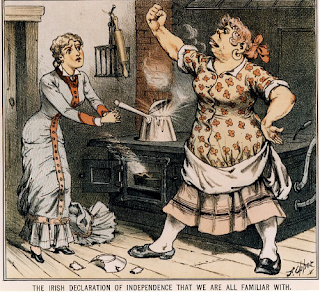 This cartoon depicts the stereotypical "Biddy" who rules the Protestant American kitchen with an iron fist. Masculine in appearance and with simian-like features, she typically harangues the helpless wife to get her way. Stereotypically she was both temperamental and clumsy, so it's not surprising that broken dinnerware is in evidence, either deliberately or accidentally smashed. While such depictions were gross misrepresentations of reality, many American households were very much dependent upon Irish domestic help as even this cartoon implies. A more sympathetic treatment of the female Irish emigrant. In contrast to harsh stereotypes held by many Americans, most Irish domestics were thrifty, resourceful, compliant and skilled. While many Irishwomen saw in domestic service an opportunity to escape the horrific economic and restrictive social conditions in Ireland, others were compelled by economic necessity to enter service. Nonetheless, work as maids, cooks, laundresses, and other domestic helpers frequently paid better than industrial employment, affording these women a level of upward mobility unthinkable back home in Ireland at the time and assisting their assimilation into American society. Herrick, Christine Terhune, "Which is Mistress? ", Ladies' Home Journal, 3:5, 1886. The Search for Missing Friends: Irish Immigrant Advertisements Placed in the Boston Pilot. Volume 3: 1854-56 (Boston, MA: New England Historic Genealogical Society, 1993), p. 343. Hasia R. Diner, Erin's Daughters in America: Irish Immigrant Women in the Nineteenth Century. Baltimore, MD: The Johns Hopkins University Press, 1983.